1. Schedule an appointment every week (or every other week) to sort through any papers that have accumulated on your desk, in the kitchen, etc. If you're keeping up with it, this appointment should take no more than 10-20 minutes at most. Write it on your calendar so you're sure to keep the date! 2. If you're starting out with a massive collection of paper clutter, you'll need more time for your first de-cluttering appointment. Schedule a few hours to sort through files, bins, drawers - basically anywhere that paper has collected - and get rid of anything you don't need. This means notes you've written to yourself, but haven't looked at in years, crumpled old ATM receipts, and the like. If you find a scrap of paper with an address or some other relevant bit of information, transfer it to a paperless storage option, like your laptop or your smartphone. If you're unsure where it belongs, you can store and sort the info easily using Evernote.com. 3. Control the incoming paper by converting all of your bills to electronic or paperless billing. Many utility providers and credit card companies will even credit you a few bucks toward your bill for choosing a paperless statement option. 4. Create a system to keep paper sorted as you go. Try keeping designated files handy to easily separate your paper into categories: To Do; To Pay; To Read; To File. Then designate a day each week or once a month to empty each file out. 5. Have a safe place for your vital records to be stored and protected. Don't let your most important papers get tossed in with your To Do lists and other non-essentials. Scan your vital records (birth and marriage certificates, passports, original social security cards, wills, deeds, etc.) into your computer, and then keep the originals in a locked, fire safe box. 6. Trade in your desktop inbox for wall-hanging files. Unlike horizontal stacking files where papers get easily buried, a hanging system keeps things visible and top of mind. Also, it removes the clutter from your desktop, and makes staying on top of your tasks much more simple. 7. Maintain an expense folder for organizing receipts as you go. By filing your receipts weekly, you save yourself countless hours come tax time, and immediately reduce the amount of clutter on your desk, in your drawers and in your wallet. You can sort them by date, expense category, or account... just find a method that makes sense to you, so you're more likely to stick to it. 8. Mail, catalogues and magazines make up the bulk of the paper that pours into your home on a daily basis. Make sure that unwanted junk mail and circulars get recycled immediately, and take five minutes each week to shred any incoming credit card applications or other financial papers that you don't need. Keep magazines stacks from becoming unruly by stashing them neatly in a tray or basket. Then thin that basket out each week, when you do your routine paper clutter round up. 9. Click and store! Don't forget how many uses your smartphone camera really has. Snap a picture of business cards, post-it, or other paper tidbits, and email them to yourself. You can file the email in each appropriate folder within your email client, and then toss that scrap for good. 10. Choose to lose the paper, and get to the bottom of the clutter once and for all. 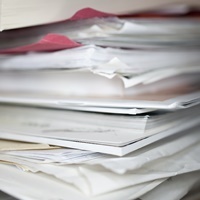 The true reason all that paper is piling up is because you've been avoiding tasks, either big or small. Make a decision to stop collecting it, and give yourself a deadline to deal with each task as it comes in. No scrap of paper should be sitting around for more than a week, so get it done, and toss it out!